The POA have condemned the announcement of the closure of HMP Kennet, following the Written Ministerial Statement made by the Secretary of State for Justice Michael Gove that NOMS will not be renewing the lease with Mersey Care NHS Foundation Trust for the site. Today the Lord Chancellor and Secretary of State for Justice Mr Chris Grayling made an announcement to close the following prisons Blundeston, Dorchester, Northallerton and Reading as part of the Governments prison closure programme. As you know the Lord Chancellor and Secretary of State for Justice Mr Chris Grayling made a written Ministerial Statement on Thursday 10th January 2013, in respect of prison capacity management. The decision last week by Secretary of State Chris Grayling to announce the closure of six prisons and partial closure of three others is a recipe for disaster. Seven prisons are to close within three months with the net loss of more than 1,500 places, despite Chris Grayling hailing plans to create Britain's biggest jail. Government plans to close down Canterbury prison have been slammed by prison officers. The jail in Milton Road is one of seven in England to be closed, with two more partially shut, the Ministry of Justice has announced today. The majority of Gatelodge readers along with our members who access the POA website will be aware that HMP Wellingborough has been earmarked to close prior to the end of 2012, decamping of the prisoners has been ongoing for a number of weeks now. The former Secretary of Justice made the announcement of the proposed closure 17 July; this being the last day (typical) parliament sits prior to the summer recess. The key reason given for closing Wellingborough (the main employer in the town) was cost to the public purse. COST!!!!!!! Wellingborough is the third cheapest Category C prison in the public estate with a budget of £10 million, some Category C budgets are two – three times this cost. Over 50% of accommodation at Wellingborough is between 6 – 11 years old this in anyone’s eyes can be classed as new build, even though the prison was built in only 1963, the older accommodation blocks do require up dating, but costings of £50 million are way of the mark and are being used as an excuse to close the prison. Since the day the announcement was made to close Wellingborough a tireless fight to overturn this decision has been ongoing from wide and various parties including, local POA, POA NEC, local MP, Wellingborough Council, PCS, and especially Mrs Lynn Holcombe local resident. Wellingborough MP Peter Bone (Con) immediately requested an emergency debate as soon as he heard the announcement, as for some reason he was not informed prior that the biggest employer in his constituency was to close, even though it is his own party in Government who made the announcement. This request was refused for 17 July, but one secured for 5 September, a full 7 weeks after the announcement. To highlight the disgust in the proposed closure it was essential that the Wellinbourgh public became aware and involved, this is where Lynn Holcombe (Officers wife) was invaluable, spending all her spare time leafleting the Wellingborough public, meeting with the local council and MPs, also starting and running a petition in the town centre at every opportunity collecting 4,000 names, this being handed to parliament the night prior to the debate by Peter Bone MP. There has been overwhelming local support for keeping Wellinbourgh prison opens. The most recent meeting of Wellingborough council unanimously passed a resolution condemning the Government’s decision to close the prison and fully supported the resolution. Lynn’s commitment and determination to do all possible to keep Wellingborough from closure is an inspiration to all, deserving all the accolades that no doubt will come her way. The media have greatly helped since the announcement, keeping the proposed closure in the public domain, no more so than Saturday 1st September when we held a protest meeting/petition signing in Wellingborough town centre when national and local media TV, radio and the press spent upwards of 2 hours with us, conducting interviews with the POA, Peter Bone MP, Paul Bell leader of Wellingborough Council, PCS, and not forgetting, the public this excellent coverage was invaluable. The support we received from the public on this sunny Saturday morning was phenomenal, with all giving their full support in opposing the closure. It is a shame the employer does not allow the same support as the public and oppose prison closures and fully support their employees. Instead a Notice to Staff was issued to all Wellingborough staff, warning them not to attend the protest meeting 1st September or debate in the House of Commons 5th September in works time because it’s against the Civil Service Code this can only be described as Shameful. Peter Bone MP secured the debate he requested 17th July prior to the summer recess and this was to be heard 5th September. Prior to the debate a protest was held opposite parliament by members of Wellingborough public, local councillors, local POA members and members of the NEC, once again excellent media coverage was gained. We all met with Peter Bone in Portcullis House for an hour prior to the debate in Westminster Hall commencing, the debate was to be chaired by Ms Nadine Dorries. Peter Bone MP in the debate gave full and comprehensive reasons and facts as to why Wellinbourgh prison should not close requesting at least a 6 month adjournment to allow a full feasibility study to take place and true costing provided. Philip Hollobone MP (Kettering) gave his full support to Mr Bone. The new Parliamentary Under Secretary of State Jeremy Wright, in possibly his first official duty since his appointment earlier the same day read from a prepared script that was maybe prepared for his predecessor and did not give much hope that the decision to close Wellinbourgh would be over turned. Peter Bone requested an urgent meeting to be held prior to the next recess of Parliament (before end of September) with the new Prison Minister and Jeremy Wright to further discuss the closure. In presenting a debate only 15 minutes is allowed and 15 minutes response. 15 minutes to decide the future of our entire colleague’s at Wellingborough, disgusting. Peter Bone hopefully will have been successful in obtaining his desired meeting and outcome of this travesty prior to going to print. 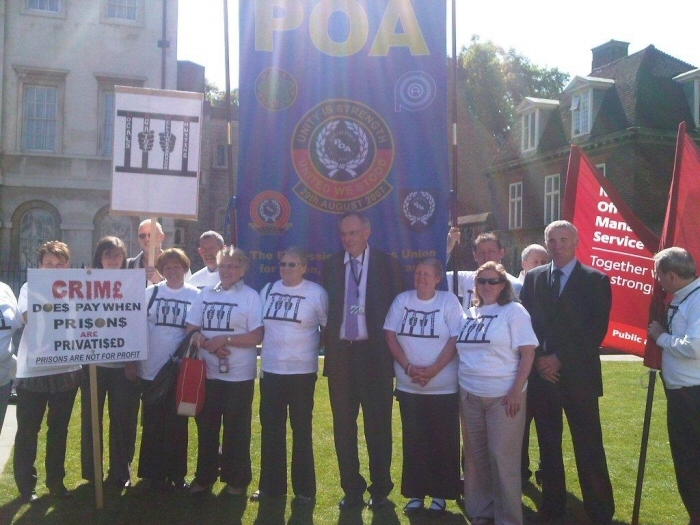 If not it will not be because of lack of effort from Martin Field, Jim Spence Branch Secretary and Chairman and the local POA committee, The members at Wellingborough, NEC, Peter Bone MP, Wellingborough town council, and of course the public of Wellingborough especially Mrs Lynn Holcombe for her tireless work since the announcement. Mr Peter Bone (Wellingborough) (Con): It is a great pleasure to serve under your chairmanship, Ms Dorries. I welcome the Under-Secretary of State for Justice, my hon. Friend the Member for Kenilworth and Southam (Jeremy Wright), the new Prisons Minister, to the debate and congratulate him on being appointed to such an important ministerial role. I know from personal experience that he will bring energy, integrity and common sense to his position. I appreciate that he will not have had time to acquaint himself with the situation at Wellingborough prison and that he will have to read a speech largely prepared by his officials, but I hope that the debate will allow him to reflect on the situation and postpone any immediate closure of the prison. It would be most unfortunate if the first action of a new Prisons Minister was to close the third most cost-effective prison in the country. When it was announced that Wellingborough prison was to be closed, I knew that 600 jobs were at risk in my constituency; I did not know that it would also lead to every Minister in the Justice Department losing his job. I would like to thank Mr Speaker for granting me this debate in the first week back after the summer recess. At 9.30 am on 17 July, the House’s last sitting day before the summer recess, the Secretary of State for Justice announced the proposed closure of Wellingborough prison. I was given no prior warning about the decision and found out about the announcement only during a live BBC radio interview. That was an unacceptable divergence from parliamentary protocol and utterly disrespectful to me as Member of Parliament for Wellingborough; more importantly, however, it was disrespectful to my constituents. By contrast, when Wellingborough prison was placed into market testing, the then Justice Secretary, the right hon. Member for Blackburn (Mr Straw), personally phoned me from Downing street at 6 am to inform me of the decision. He was gracious enough to warn me in advance of the announcement and to answer any of my questions on the matter. In addition, he made an oral statement to the House of Commons during which hon. Members from all parties, including myself, could ask him questions. That was a far cry from the miserable, secretive and back-handed action taken by the previous Secretary of State for Justice in this Government. I am afraid that this is yet another example of Departments wanting to ignore Parliament, ignore scrutiny and avoid debate, and of the Executive thinking they know best and that anybody else’s ideas are irrelevant. They regard Parliament as an annoying irritant that should be avoided as much as possible and think that, when it cannot be completely avoided, policies should be rushed through with the absolute minimum scrutiny. Mr Philip Hollobone (Kettering) (Con): I congratulate my hon. Friend on securing the debate and on the excellent way he has run the campaign to save Wellingborough prison on behalf of his constituents. No constituency could ask for a more hard-working Member of Parliament. In the light of all the bad practice that my hon. Friend has highlighted, is not this a wonderful opportunity for the new Minister to stamp his authority on his Department and his civil servants from day one, and to say clearly that what has gone on is not up to standard and that they should go away and think again? That would earn him the respect of the civil servants under him and force them to think again. Mr Bone: I am grateful for the kind words of my hon. Friend and neighbour, and for his usual sensible advice to the Government, which I urge the Minister to take on board. The Minister’s mind must be in a whirlwind at the moment, given all the things that he has to deal with, but this is not just a little local matter—it needs to be addressed. Immediately after I heard the announcement on the closure of Wellingborough prison, I applied to Mr Speaker’s office for an emergency debate under Standing Order No. 24. Although Mr Speaker was sympathetic to the important issue, he was unable to grant me an immediate debate, partly because the announcement was made on our last sitting day. It is rare for the Speaker to allow a Member even to make a Standing Order No. 24 application. Parliamentary protocol requires a Minister from the relevant Department about which a Standing Order No. 24 application is made to sit at the Dispatch Box and listen to it, yet the Ministry of Justice failed in this regard—no Minister was present. Yet again, this was gross discourtesy to Parliament. The key reason given by the Ministry of Justice for the decision to close Wellingborough prison was cost. According to the Government, its closure would save the taxpayer £10 million a year and a further £50 million in renovation costs. However, if Wellingborough prison is so expensive to the taxpayer, why do the Government’s own figures show that it is the third cheapest prison in the country? The National Offenders Management Service annual report shows that there were 122 state-owned prisons in 2010-11, and that Wellingborough prison had an annual cost per prison place of £27,898, with the national average being £39,175. In other words, according to the Ministry of Justice’s figures, Wellingborough prison is £11,277 cheaper per prisoner than the national average—more than 28% cheaper. Wellingborough is therefore more than a quarter cheaper to run than the average prison in the country. Only a Department dominated by lawyers could think that closing Wellingborough prison would make good economic sense. Only lawyers could think that closing the third cheapest prison in the country on economic grounds would be right. If there is a need to close a prison, that should be an outdated Victorian prison with a higher cost per prison place. It is estimated that £50 million is needed to renovate the prison but, as a chartered accountant, I am always wary of an estimated figure that happens to be a neat rounded sum. To me that is almost saying, “Let’s make up some huge figure to make it appear that Wellingborough is uneconomic.” I have looked into the economics of the capital investment and that is exactly what has happened. At this stage, I shall thank my researcher, Adam Trundle, for many of the facts and figures that I am using today. First, the cost is a capital one, which would be spread over the useful life of the asset being built, which in this case is around 40 years. It would not be a revenue cost and it would not be £50 million a year. It would be only a small extra cost per prison place per year, and it might even work out that there would be a saving to the cost per prison place. If a new, modern building was built to replace the older 1960s part of the prison, the number of prison officers needing to manage that building would be dramatically reduced. There would be significant savings in the costs of lighting and heating, and significant savings in repairs. Instead of increasing revenue costs, they might actually be reduced. Even if there was no saving to the revenue cost due to running a new building—of course, that is nonsense, as there would be a significant saving—the cost per prison place at Wellingborough would increase by only around £2,000 per year, which would mean that Wellingborough prison would still be well below the national average for cost per prisoner place. The Chancellor of the Exchequer is desperate to kick-start the economy into growth through capital infrastructure projects. The renovation of Wellingborough prison is therefore exactly the type of project that the Chancellor and the Government are looking for, so I do not think that the new Prisons Minister should cross the Chancellor at such an early stage in his ministerial career. If we had some joined-up government between the Ministry of Justice and the Treasury, the renovation of Wellingborough would be a win-win situation: the Treasury would get a quick and relatively inexpensive infrastructure project to boost jobs and the economy; while the Ministry of Justice would get a more energy-efficient and modern prison that would last for years. In the response of the previous Secretary of State to my letter about the announcement on closing Wellingborough prison, he painted the prison as a 1960s borstal that was outdated, deteriorating and falling to bits. He did not mention, however, that half—actually, it is more than half—of the prison is less than a decade old, with modern facilities and the ability to hold 300 prisoners. In fact, the contractor for the new prison buildings at Wellingborough received a national award of excellence in 2006. If the reason for closing the prison is because it was originally constructed in the 1960s, and that it is therefore outdated, although more than half of prison was built in the past 10 years, how does the Ministry of Justice explain two much older prisons that are close to Wellingborough—Leicester and Bedford—remaining open while the more modern Wellingborough prison is closed? Both Leicester and Bedford were constructed in the early Victorian era. They are also not as cost-effective as Wellingborough, as is shown by the Government’s figures. They both cost more than £50,000 a year per prisoner, which is £20,000 more than Wellingborough for each and every prisoner. The following category C prisons—the same classification as Wellingborough—all cost more than £40,000 per prisoner place: Brixton, Bullwood Hall, Canterbury, Castington, Coldingley, Kennet, Kingston, Lancaster Castle and Shepton Mallet. If we were to close any one of those prisons, we would save more than £10,000 per prisoner place compared with Wellingborough. It is absolutely absurd to say that Wellingborough prison is being closed on the basis of economic cost. Another reason that is given for allowing Wellingborough prison to be closed is the supposed decline in the prison population, but that comes after years of announcements by the Ministry of Justice that prisons were full and overcrowded, which forced the previous Labour Government to let out prisoners early before they had completed their sentences. The Ministry of Justice’s figures show that, in 2005-06, the prison population was 76,564 in 139 prisons throughout the country. In 2011-12, the prison population had increased to 86,638 in only 136 prisons. That represents a 10,000 increase in the prison population over six years, with the actual number of prisons declining. Today, the prison population is even higher—at 86,801. How can the Ministry of Justice claim that the prison population is falling when, in every year over the past decade, the Department’s own figures have shown a constant increase in the prison population? I suggest that the Ministry of Justice is as good at predicting the prison population as G4S is at hiring enough staff for the Olympics. Last week, a review by the highly respected Prison Reform Trust claimed that almost two thirds of prisons in England and Wales were overcrowded. In fact, the trust said that there are 7,294 more prisoners than the system was designed to hold. Even with a supposed spare prisoner capacity of 3,500, the prison system will still be almost 4,000 places short to deal with overcrowding. The overcrowding is so severe that one of our closer neighbouring prisons, Leicester, is running at 171% of capacity—it has a designed prisoner capacity of 200, but it actually holds 342. The overcrowding means that there is a higher ratio between prisoners and prison staff, which leads to prison staff having less time to spend rehabilitating inmates, thus further increasing reoffending rates and putting more pressure on the prison system. Closing Wellingborough prison would only make an unacceptable situation even worse. The governor and staff of Wellingborough prison have been recognised by the former Secretary of State for Justice and the former Prisons Minister for their excellent work improving the prison. The independent monitoring board reported that Wellingborough improved from being a level 2 to a level 3 prison, which is one of the highest levels possible in the prison system. Wellingborough prison has also moved from 123 out of 130 in the prison rankings to 93, because of the hard work and commitment of its governor and staff. The prison has also become far more cost-effective, with efficiency savings of 5% in 2011-12 and a further 3% planned this year. In fact, the number of staff members has reduced by 12 since Wellingborough prison was put into market testing, which shows how efficient the prison staff have been in maintaining high standards. I should mention the determination of the prison staff to make those improvements to Wellingborough prison. They are following the debate carefully. Moreover, the local prison staff have ignored their national union to implement change, so they should be applauded by the Minister for their actions, not kicked in the teeth. There has been overwhelming local support for keeping Wellingborough prison open. The most recent meeting of Wellingborough borough council unanimously passed a resolution condemning the Government’s decision to close the prison and supporting my campaign to keep it open. There was a united front from all political parties on the council in support of the resolution. Lynne Holcomb and Martin Fields have organised an energetic campaign to keep the prison open, and they organised the “Save the Prison” petition with 3,000 signatures that I presented to Parliament last night. There was a massive protest meeting in Wellingborough town centre on Saturday in support of keeping the prison open. There have also been community meetings that have been attended by me, the leader of Wellingborough council and other councillors. Even today there was a protest outside Parliament by prison officers, their families and members of the public. I have a simple proposition for the new, excellent, understandable and understanding Minister, who takes on board arguments and acts accordingly. I request that the new Secretary of State for Justice postpones the decision to close the prison for at least six months and stops the transfer of prisoners from Wellingborough. That would allow time for a proper and fundamental review of the prison system throughout the country. It would also allow the costs and benefits of closing any prison in the country to be analysed to see what prison, if any, is suitable for closure. That would allow for a well-thought-out decision, and for the most expensive prison to be closed. It would also surely prove that there are no financial grounds whatever to close Wellingborough prison. Let us have a proper prison closure plan, if necessary, that is based on clearly identifiable costs, not a random knee-jerk closure of one prison. I firmly believe that this is the wrong prison being closed for the wrong reasons at the wrong time. The Parliamentary Under-Secretary of State for Justice (Jeremy Wright): It is a pleasure, Ms Dorries, to see you in the Chair. This is my first opportunity to speak with my new responsibilities. It is an even greater pleasure to be able to respond to my hon. Friend the Member for Wellingborough (Mr Bone). I congratulate him on obtaining this debate, and on how he presented his case. I agree entirely with the assessment by my hon. Friend the Member for Kettering (Mr Hollobone) of how he serves his constituents. I want to put on the record the Government’s appreciation of the continued efforts of all those who work at HMP Wellingborough. Like front-line staff in prisons throughout the country, they do a huge amount of excellent work that is hidden behind prison walls. I want to make it clear that any decision to close the prison is not a reflection of their work or performance. My hon. Friend the Member for Wellingborough knows that any decision to close a prison is not taken lightly, and is never easy. As he would expect, it follows a comprehensive evaluation process led by senior operational managers in the Department and in the National Offender Management Service. Any such decision deserves an explanation not just to him, but to those he represents and to those who have campaigned to keep HMP Wellingborough open. The way in which he heard about the announcement of the closure is, as he said, profoundly unacceptable. It should not have happened, and I apologise to him for that. I want to explain why the decision was made, and to set out the context for the decision-making process. As my hon. Friend knows, it is the duty of any Government to ensure that the prison system retains sufficient capacity and resilience to manage all those committed to custody by the courts. I assure him and the House that neither the Secretary of State nor I, as the prisons Minister, will announce any reductions in prison capacity unless we are confident that that duty can be discharged. It is equally clear that the Government have a duty to their citizens to ensure that we make best use of public funds. As a result, we must ensure that we do not maintain an over-provision of prison accommodation or operate prisons that are uneconomic. My hon. Friend should know that there has been the sort of comprehensive analysis that he says he wants across the system to determine which prisons those should be. The prison system is necessarily complex, as my hon. Friend understands it must be to meet a variety of needs. They include being able to receive new prisoners direct from courts throughout England and Wales, providing health care and education, tackling deep-rooted, dangerous and harmful behaviour, and providing specialist intervention to particular groups of prisoners. Maintaining a wide geographical spread of prisons and a functional balance that meets the changing needs of the prison population is essential. By doing so, we remain able to carry out the punishments by the courts, to maintain strong security to protect the public, and to provide opportunities for different types of offenders to reduce the likelihood of them committing further crimes. Accordingly, individual prisons are robustly assessed to determine whether their closure is operationally viable before a recommendation is made. My hon. Friend has reminded me that this is my first day in the job with all the constraints involved. A large proportion of my career at the Ministry of Justice so far has been spent on HMP Wellingborough, and I have, as he would expect, asked some questions about the decisions that have been made. I am satisfied that the process has been followed correctly, and that all the necessary criteria have been met. I know that that will discourage him from continuing his campaign, and I fully understand that. I and, I am sure, my right hon. Friend Secretary of State for Justice will be happy to discuss the matter with him further, but I want to be realistic. Mr Bone: I am grateful to the Minister for reading out the notes from his officials, and he is doing exceptionally well. I thank him for offering to have a meeting with me and perhaps the Secretary of State. Can that meeting to take place soon? Otherwise, there will be no point in having it. Jeremy Wright: At this early stage in my career, I cannot speak for my diary, let alone for that of the Secretary of State. However, I have no doubt that if my hon. Friend, with all his persistence and eloquence, asks the Secretary of State for a meeting, he will get one as soon as it can be arranged. Mr Hollobone: I very much respect the Minister, who is a good man, but this is day one of his job, and he has not even had time to sleep on the matter. As a human being, he cannot possibly be confident that the assessment of this prison closure is right. I know that that is what his officials are telling him, but he has simply not had time to digest it and to think about it. It would be perfectly reasonable for him to tell the House that as it is day one of the job and he has not had time to sit and think about the matter, he will postpone the decision for a set period. He could then be confident about whether it should close. Jeremy Wright: My hon. Friend makes a tempting offer. This may be day one for me in the job, but it is not day one of consideration of the issue. If he is patient, I will try to explain the work that has been done, and the reasoning that led us to the decision. I take him back to July when the then Secretary of State announced the closure of HMP Wellingborough. The gap between the prison population and our useable capacity then stood at 3,500 places, which represented the most headroom experienced in the prison estate since early 2011, with more empty prison places than there were before last year’s announcement of the closures of HMP Latchmere House and part of the Hewell cluster, formerly known as HMP Brockhill. It also represented more unused places than were available immediately before the serious public disorder in August 2011, and I remind the House that the prison system coped admirably with the unprecedented prison population growth experienced following those events. Wellingborough made about capacity within the system. Accordingly, it is clear that the loss of 588 places at HMP Wellingborough will not materially affect the Government’s ability to accommodate all those who are committed to custody by the courts in the foreseeable future. It has taken longer than we would have hoped to determine the prison’s future, not least because of the significant pressure placed on the prison estate in the aftermath of last year’s public disorder. However, in the intervening period, the continued deterioration of the site has only served to make the need for a decision more pressing. They key point is that the cost of running the prison is not solely operational, as there are also costs for repairs and for bringing the prison up to an acceptable standard. My hon. Friend mentioned that Wellingborough is the third most cost-effective prison in the country, but as ever, it depends on how that is calculated. That statistic relates to the prison’s running costs; it does not take account of the capital costs required to deal with the backlog of improvements that are needed on site. He is right that Wellingborough has an annual budget of £11.6 million for 588 places, which does not compare unfavourably with other prisons of the same type. However, as it was built in the 1960s, the physical fabric has deteriorated over the years. Mr Bone: I hope that the Minister does not believe everything he is being told. More than half the prison was built in the last 10 years and it is exceptionally modern. The renovations that he mentions are about knocking down and completely rebuilding the old part of the prison. It is not quite as he is explaining it to this Chamber. Jeremy Wright: In my understanding, it is true that almost half the current prisoner accommodation was built in the last 12 years, but sadly, that accounts for less than 25% of the prison’s overall infrastructure. It is not simply the accommodation that needs bringing up to standard; many other improvements are required and I shall come back to those, if my hon. Friend will forgive me. My hon. Friend mentioned the figure of £50 million, which is the amount required in a major refurbishment programme. He is right that there is no such thing as an accurate, round number in these matters—if he wants the accurate figure, however, I understand that it is £49.7 million, and I hope he will forgive that being rounded up a little. The prison is increasingly unsafe, with poor services and infrastructure. The proximity and size of the financial liability has presented prison management with a decision. We could either proceed with the outstanding and necessary refurbishments, which, as I have said, are estimated to cost up to £50 million. That would improve the wings that were not built in the past 12 years—wings A to E—and includes the services infrastructure. That would happen at a time when there is sufficient prisoner accommodation in the rest of the prison estate and many other pressures, as my hon. Friend knows, on the Department’s budget. Alternatively, we could close the prison and use the capital to better effect elsewhere. Prison closures are only part of the Department’s wider strategy, and we will discuss them at length on another occasion. I hope that my hon. Friend will accept—if not today, at subsequent meetings—that we have looked at this very carefully. I am sorry that I cannot offer him better news this afternoon. I can assure him, however, from what I have been able to determine, that careful consideration has been given to the matter. Nadine Dorries (in the Chair): Order. We move on to the next debate.